Happy Valentines Day to everyone, what could possibly go more hand in glove than food and romance? I can still remember the thrill of feeling ever-so-grown-up when my first date took me to a restaurant, I was 18. I felt so special and since that time I have connected Valentines with Food. A few years back, pre-twins, we booked into a very popular Italian restaurant beautifully set on a country green in a well-to-do village with a menu that has your taste buds drooling from the front page but sadly they had overpacked their Valentine’s night into two sittings. We were cramped in a corner with a waiter who was rushed off his feet and the experience was so poor we never went back. These days we eat in and avoid being part of the masses! I’ve been wondering what culinary delights to prepare for our romantic dinner, I’ve had a good thumb through Jo Pratt’s In The Mood For Entertaining and I’ve settled on Seared Scallops with Smoky Leeks and Orange Butter for my starter now I just have to confirm main and dessert. Here’s what’s inspiring me so far. Cook Sister! That’s Jeanne (who will also be speaking at Brit Mums Live this Spring) always comes up trumps when it comes to good foodie ideas, she has Pork Filet stuffed with Pear and Sage as a classic. Here’s a lady who’s avatar alone is enough to grab my attention! Beth Sachs writes Jam and Clotted Cream A Cornish Food Blog. 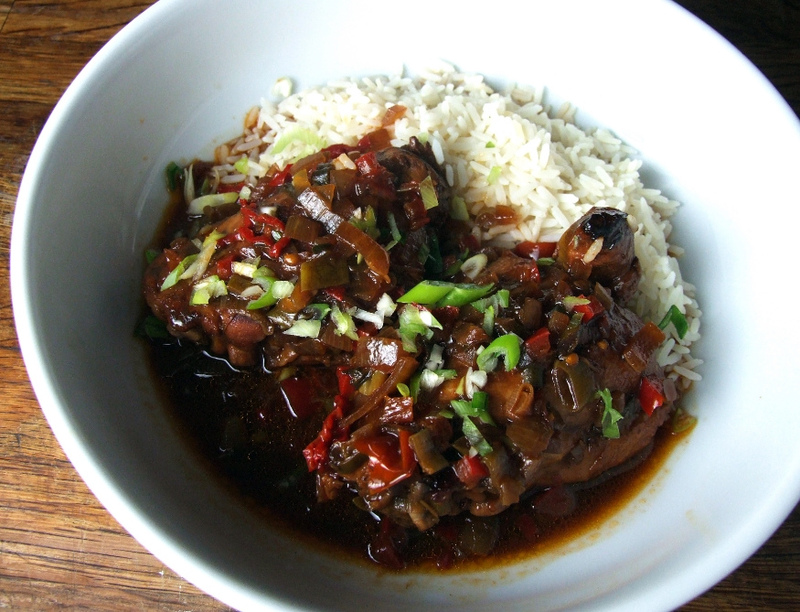 It’s a mixture of reviews, recipes and fun and her latest recipe is Sweet and Sour chicken but in her archives I found a recipe for Spicy Beef, Spinach Stir Fry and Egg Fried Rice. 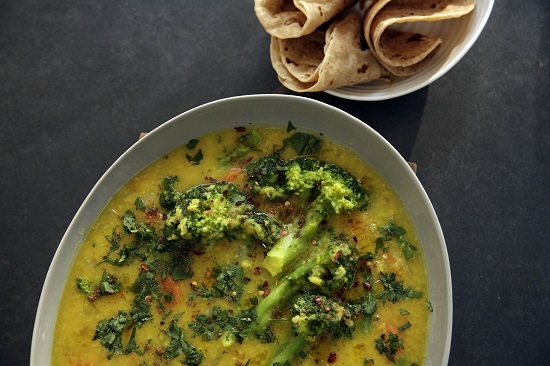 Eye-catching and tasty one-pot vegetable dahl by Mallika Basu. Laura Scott writes How To Cook Good Food Her Teryaki Salmon and Stir Fried Greens would make a scrumptious main dish. If it’s an Indian night that takes your fancy you really must check out Quick Indian Cooking where Mallika Basu has enough recipes to blow your mind. She also has a book called Miss Masala. Why not make an easy but indulgent homemade Indian with her one-pot vegetable dahl, spiced peas, tandoori chicken and healthy mango fool. Kicking off St Valentines in style is Emily from A Mummy Too who has put together a three-course menu Olive Tapenade, Creamy Pasta and lemon cheesecake. She is mummy to Joel who often comes up with some cute kid classics and she has a brilliant idea to get the kids involved White Chocolate and Strawberry Icing Hearts. Cass from The Dairy of a Frugal Family whilst trying to survive the credit crunch and pass on her tips she suggests a Chocolate Fudge Pudding that is to die for. 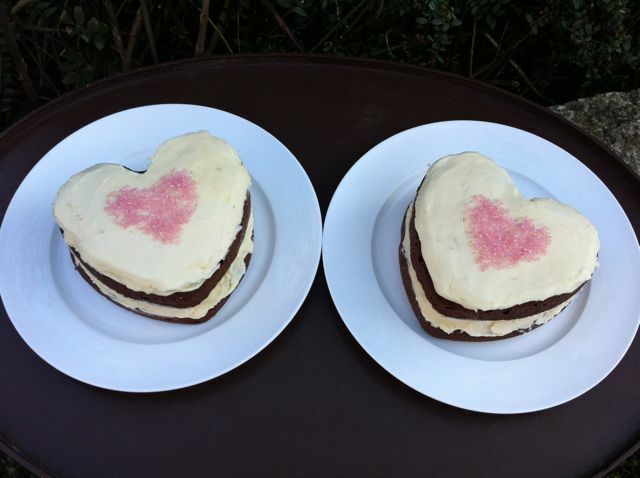 @choclette8 talks nonstop chocolate and writes Chocolate Log Blog, she never runs out of ideas and her Valentines Heart Cakes are simply beautiful to look at — too beautiful to eat? I don’t think so, where’s my fork? Her We Should Cocoa challenge for February is ‘something savoury and vegetarian with chocolate’ any ideas? I’m stumped. One more delicious idea comes from Eat Like A Girl who wins me over with Boozy Raspberry Chocolate Brownies. So food lovers get cooking and make this a special Valentine’s meal and make this February 14th one to remember. BLOGS AT: Mari’s World; TWITTER: @maris_world. Mother of four and nana to three, Marianne Weekes has spent half her life in the UK and the other half in Italy. Blogging since Jan 2010, she finds it hard to drag herself away from her laptop and writes about food, travel and lifestyle. Always on the lookout for the next thing which takes her down many surprising lanes. Previous Post Expat Mum joins Getting Published panel at BritMums Live! Next Post Newbie Tuesday: The Half Term fail! What a great round up of food ideas. I will be visiting some of these blogs later on this evening. Happy Valentine’s to you!! I’ve added some easy chocolate ginger truffles – lots of ginger going on in the link up! Thanks for the mention! 🙂 Sorry we didn’t get to meet the other day, we got stuck on a train behind a signal failure for 2 hours!